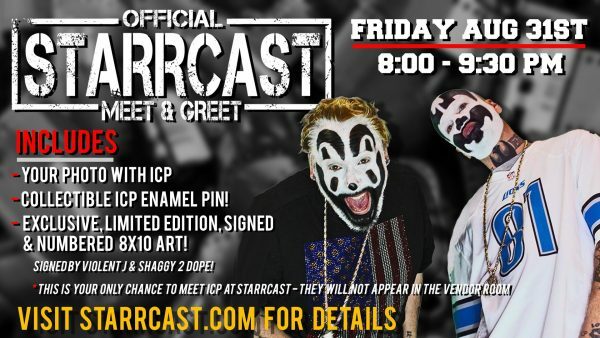 Over the weekend, it was announced that the Insane Clown Posse will be a part of an event called the All In Starrcast which is a 4 day Wrestling Fan Expo happening in Schaumburg, IL! ICP is scheduled for an event on Friday, August 31st, and it’s one that you’re not going to want to miss! First, J and Shaggy will be a part of the Official Starrcast Meet & Greet. You can have your photo with ICP, will receive a hat pin, and an autographed 8 x 10! This will be your ONLY chance to meet ICP at Starrcast as they will not appear in the vendor room. Now the event that they will take part in is something that should be ridiculously hilarious! They will sit and watch StrangleMania and review it LIVE! Now that is pretty fresh if you ask me! This event will be available to ALL Starrcast ticketholders! I can’t wait to hear how this all goes down!